SIIG's Ultra Compact Retractable USB Optical Mouse - Black provides smooth and precise navigation without the hassle of tangled wire. It features 3-button with scrolling wheel to offer fast navigation for web browsing and general operations. Retractable USB cable design eliminates cable clutter and is ideal for travel. Compact palm size footprint is light and easy to carry. 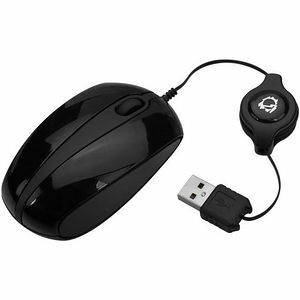 This USB retractable optical mouse works on most surfaces and is a reliable tool at an affordable price.